I shared a photo and some quick thoughts about the mask on Instagram a couple nights ago, but today I'm going to share a few more details here. Like the name implies, this is a two step mask. The mask set is designed to brighten and soothe one's complexion. The first step is an aha peeling swab that "draws out unwanted dead skin cells and blackheads which soothes the overall complexion." 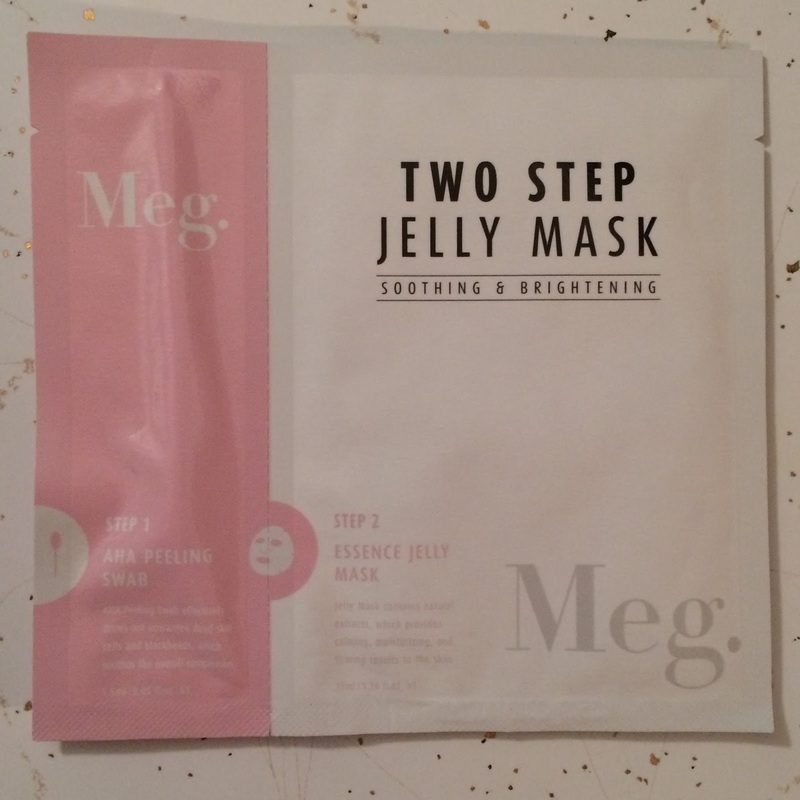 While the second step is a sheet mask saturated with a jelly essence providing "calming, moisturizing, and firming results to the skin." 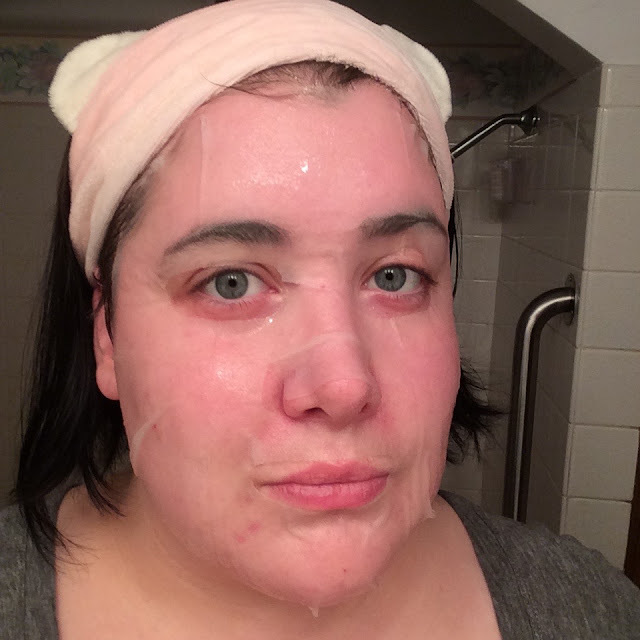 Normally I use sheet masks after my serums and ampoules to help everything absorb better before I seal it all in with a moisturizer or sleeping pack - but because this mask included an exfoliating step I used it after cleansing and toning my skin, and used a sleeping pack afterwards. 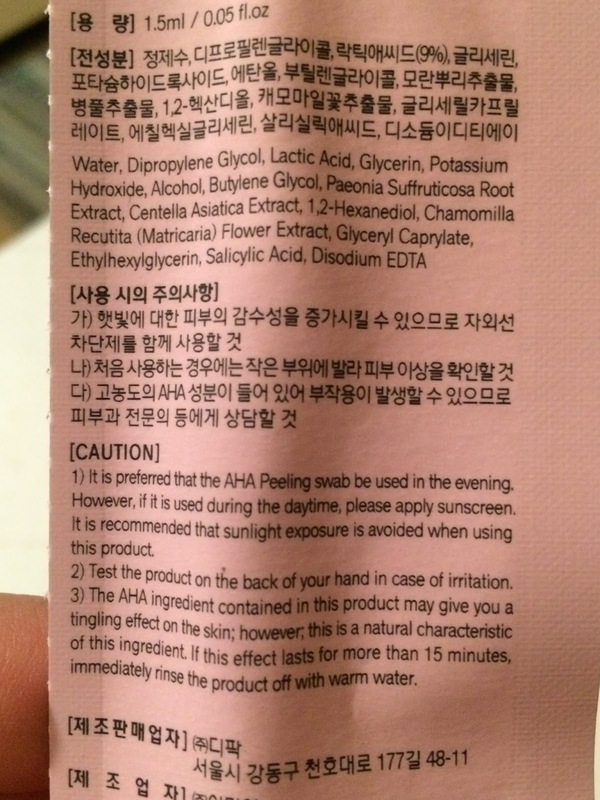 Step 1: Water, Dipropylene Glycol, Lactic Acid, Glycerin, Potassiom Hydroxide, Alcohol, Butylene Glycol, Paeonia Suffruticosa Root Extract, Centella Asiatica Extract, 1,2-Hexanediol, Chamomoilla Recutita (Matricaria) Flower Extract, Glyceryl Caprylate, Ethylhexylglycerin, Salicylic Acid, Disodium EDTA. 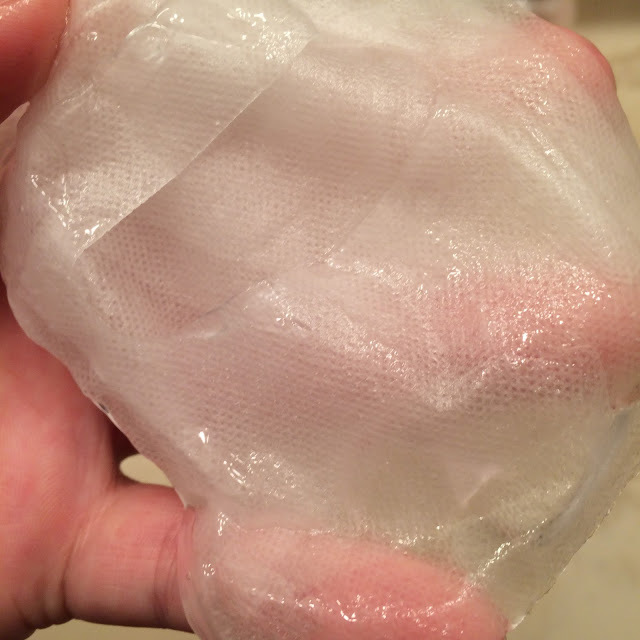 Step 2: Water, Dipropylene Glycol, Glycerin, Bis-PEG-18 Methyl Ether Dimethyl Sikane, PEG-60 Hydrogenated Castor Oil, Buthylene Glycol, Ammonium Acryloyldimethyltaurate/VP Copolymer, Polyacrylic Acid, Paeonia Suffruticosa Root Extract, Centella Asiatica Extract, 1,2-Hexanediol, Dimethicone, Chamomilla Recutita (Matricaria) Flower Extract, Glyceryl Caprylate, Potassium Hydroxide, Cellulose Gum, Ethylhexylglycerin, Rosa Damascena Flower Extract, Nelumbo Nucifera Flower Extract, Jasminum Officinale (Jasmine) Extract, Punica Granatum Fruit Extract, Disodium EDTA, Fragrance. This mask comes in traditional mask packaging - which is a large foil envelope that you tear open. The swab is also encased in a foil enveloped, which is separately attached to the mask by a perforated line that you can tear apart. I didn't notice much of a scent with the first step - the swab smelled like a typical aha liquid, which has a slight iron smell to me. 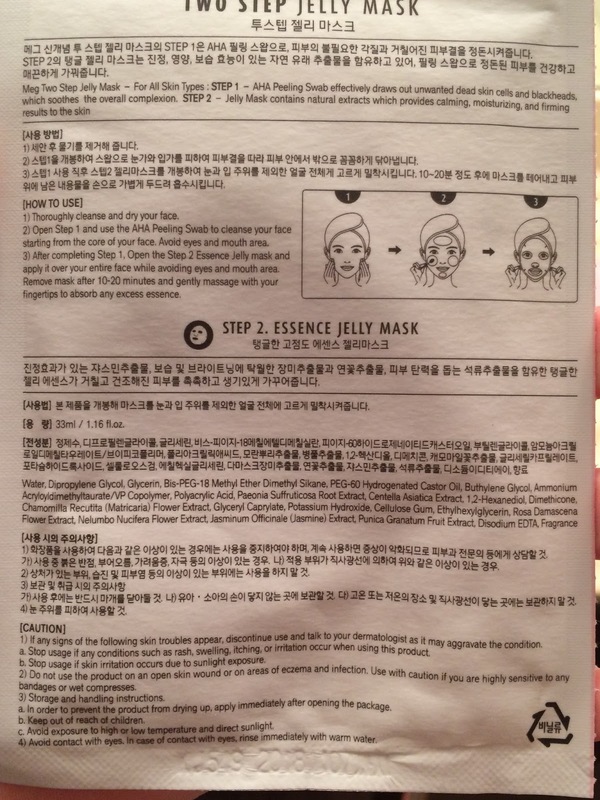 The second step, which is the mask, had a pretty non-descript "fresh" scent to it. I did not find it overwhelming, which I note because often times strong scents cause migraines for me, but instead found the light scent to be very calming and relaxing as it slowly faded over a few minutes. 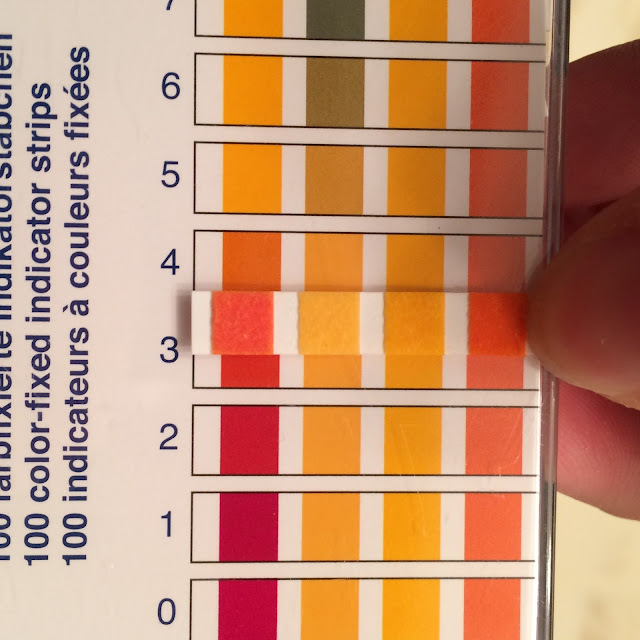 Starting out I fairly satisfied with the pH of ~3.5 that the aha swab brings. 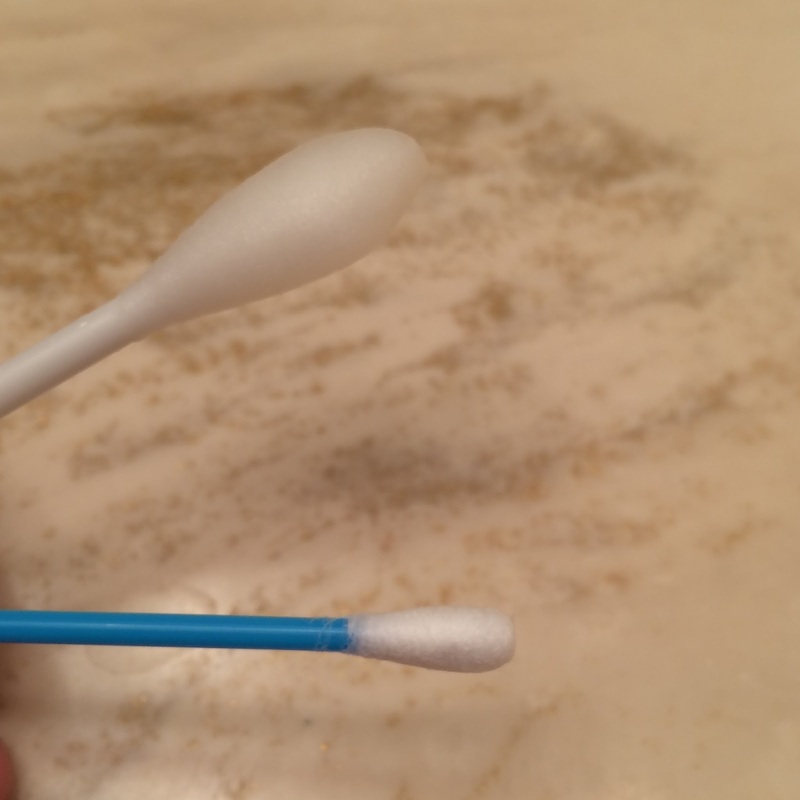 In my past experiences single-use swabs like this tend to have a higher pH of around 4 or 5, which doesn't really help out all that much in terms of chemical exfoliation, and tend to rely more on alcohol to get your skin to "peel." After rubbing the swab on my face, I noticed a few tiny clogs had gotten pushed out of my pores so I felt pretty good about that too. The mask included plenty of essence, and I liked that the essence was like a thick gel - I was able to really get a nice layer of jelly onto the mask that slowly absorbed as it melted against my skin. 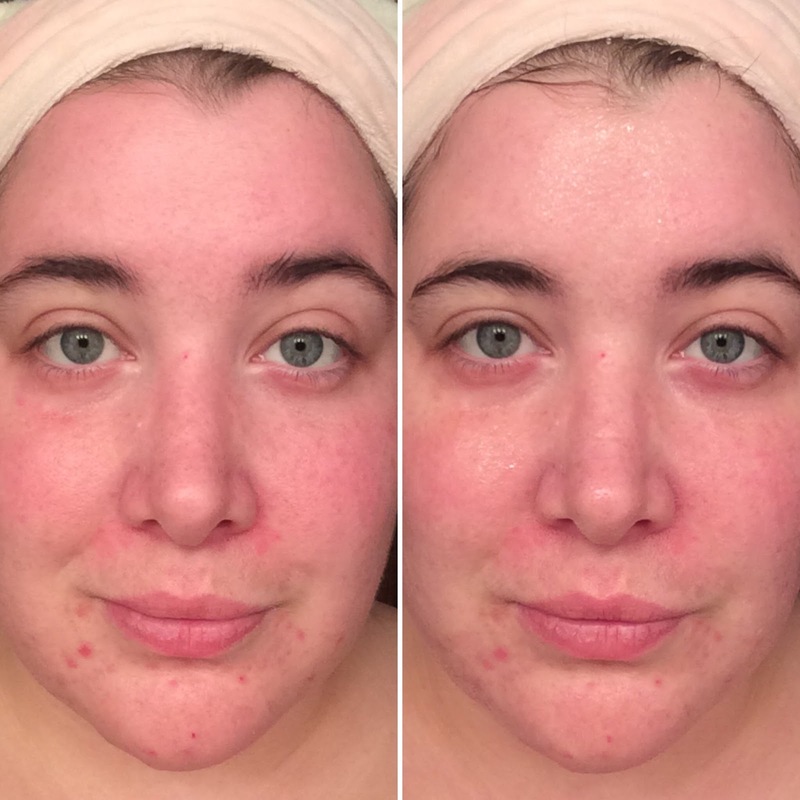 I was also able to see a noticeable brightened calming effect after I had removed the mask, which I was grateful for considering how red, dry, and irritated my skin had been previously. I wasn't too pleased to see alcohol in the aha swab, but surprisingly it didn't sting or dry out my face at all. I thought that the mask material was a bit stiff and bunched up a lot - but thankfully the thick jelly held the mask itself into place pretty well. 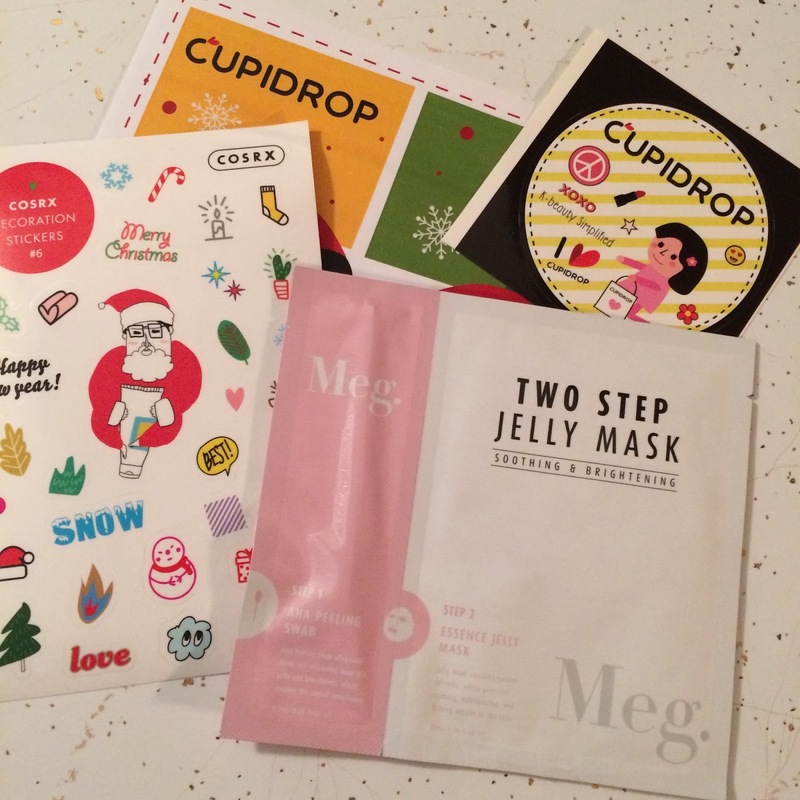 I received this complimentary from Cupidrop to review, but they sell the mask on their site currently for $6 each. For a daily masker like myself this price is a bit high, but for occasional use this is a decent value for the brightening effect I received. Maybe. This mask set wasn't a "must have" for me, but I did enjoy it and found it did a great job brightening up my complexion. I do think the price is a bit high, like I mentioned above, but if my skin was looking dull before a special event and I wanted to brighten and calm my skin I'd definitely use this again.